A woman from the Netherlands who is a frequent visitor to Rapture Ready proposed we address a troubling thought she lives with as a Christian. It is a paradox I believe many Christians who look for Christ to come for believers in the rapture have considered, at least to some extent. Every time I see these articles, I am on one hand horrified at the treatment of the Jewish people but on the other hand full of anticipation as I know that with each event that pushes the Jewish people back to their homeland of Israel, the closer the rapture is for Christians. I do feel badly that I am excited for the rapture though as I know what that means for those that will be left behind... Should we be as excited as I am to know that we can (I believe "will") be raptured any second? I know this gives me an urgency to share the gospel with friends and neighbors, but I still always feel guilty for the anticipation and excitement I get when I see the current events played out daily. "For then shall be great tribulation, such as was not since the beginning of the world to this time, no, nor ever shall be" (Matt. 24:21). Those left behind will, the Christian knows, include perhaps close friends and beloved family members. So, the paradox of wanting the rapture to take place, and at the same time dreading it for those who will stay on this planet that will endure God's judgment and wrath is, to some, troubling. 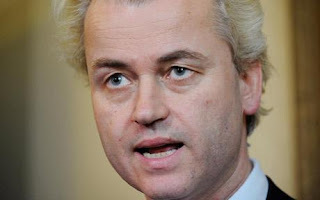 The article the emailer sent contained a speech by Geert Wilders, a Dutch Member of Parliament for the Netherlands. He synopsized with stunning description how Israel's Islamic enemy is systematically infecting Europe, thus threatening world stability - or what little of it that remains. Wilders, who is chairman of the Party for Freedom, the Netherlands, spoke at the Four Seasons, New York, introducing an Alliance of Patriots and announcing the Facing Jihad Conference in Jerusalem. He announced that Europe is in dire straits as it undergoes Islamization. America and the world, he warned, face the same fate as Europe if the threat isn't confronted and defeated everywhere it exists. Wilders said that entire city sections throughout Europe are taken over by Islamics one street at a time. Local governments and police forces are often so intimidated that they dare not go into those areas to govern. Women, treated no better than slaves, according to the speaker, are covered from head to toe in tent-like attire, sharia law takes precedence, and women in sections of the cities not part of the Islamic communities more and more hear hate-filled shouts of "Whore!" from those of the Islamic populations. Israel and its being targeted for extinction is the sure sign that the tribulation is in view. The rapture of the church is, therefore, an event that must be very near to occurring indeed. That being the obvious case, what should be the Christian's foremost priority? The answer is that it should not be considered a paradox for the believer, but an exhortation, a call to duty. There is nothing anyone can do to hurry or delay the coming of Christ for His saints in the rapture. The timing of that great event is out of our hands. Therefore, longing for the blessed hope (Titus 2:13) to rescue us from the terrible time to come (Revelation 3:10) doesn't conflict with our concern and compassion for those who will be left behind if they don't come to Christ for salvation. It is time for those who name the name of Christ to recognize the lateness of the prophetic hour; witness to those around us of the truth that Jesus Christ is the one and only Way to salvation; and live in such a way that we can earn our Lord's commendation, "Well done, good and faithful servant."